The lens has a focal length of 50-200 mm. Since the lens is designed to be used on a camera with smaller sensor ('APS-C') the focal length will be equivalent to 80-320 mm if you have a Canon camera or 75-300 mm if you have a Niko camera. One thing to consider is that the lens has a variable brightness, which means that depending on how much you are zooming the lens will have a different maximum aperture value. At 50 mm the lens brightness is f/4 and at 200 mm the brightness is f/5,6. Through the link below you can read more about what this could mean for you as a photographer. If you buy this lens it will come with a lens hood, whose model name is "LH674-01 686". 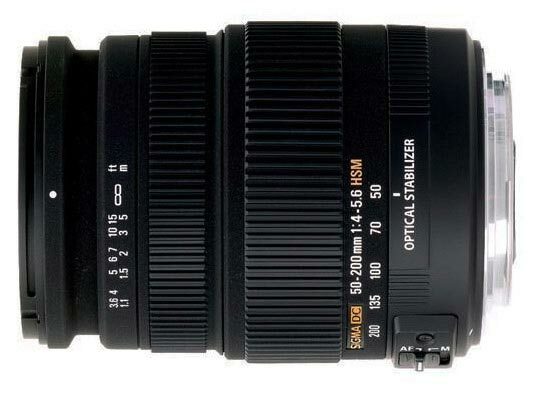 Sigma’s 50-200mm F4-5.6 DC OS HSM is designed for portability and convenience. Its compact size makes handheld shooting easy at all focal lengths and easy to carry. With a range that is useful for candid portraiture, capturing children playing in the backyard, amateur sports or even wildlife at the zoom it’s a great all purpose lens. SLD (Special Low Dispersion) glass employed for effective compensation of color aberration, Super Multi-Layer lens coating reduces flare and ghosting and assures high image quality throughout the entire zoom range. Internal Focusing System eliminates front lens rotation & allows use of a polarizing filter for creative effects & improves the optical performance of the lens at various distances. The Sigma 50-200mm is equivalent to the popular 75 to 300mm on a full frame camera and offers a 4 to 1 zoom ratio in a compact lens that is easily carried in your camera bag or left on the camera as you travel. "